We love radicchio, and we think you should too. Radicchio, and its chicory family relatives (escarole, dandelion, frisee, etc. ), all thrive in here in our temperate climate. 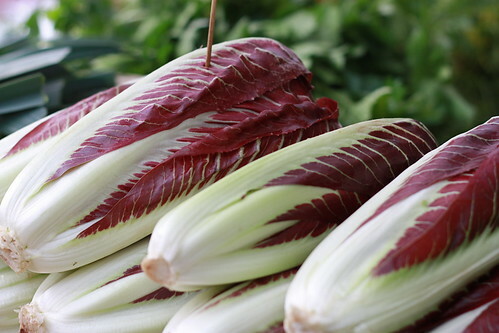 Radicchio in particular is very cold tolerant and can be harvested fresh during the months of the year when lettuce and other leafy greens are long gone. I mean, anyone trying to prove their locavore bona fides had better get on the radicchio bandwagon because it’s something local that you can get around here throughout the winter. Also, radicchio is stunningly beautiful, and, in my opinion, delicious. However, I’m afraid these lovely vegetables are also misunderstood, under-appreciated, and somewhat feared by the general populace. This little post is intended to persuade you to eat more radicchio. Look at it! How can you not want to love it! On our farm, we grow six varieties of radicchio – Treviso, Castelfranco, Varieagata di Lusia, Chioggia, Pan di Zucchero, and Rosso di Verona. Add to that Puntarelle, red ribbed dandelion, frisee, and escarole and we are growing 10 varieties of bitter, sweet, delicious chicories in all. We usually have radicchio available for harvest from about July through March, barring wintertime flooding, but its peak season is from about now (mid-September) through January. Growing in the field, the plants are pretty nondescript – they grow large, dull green outer leaves, which conceal the dense heart of the plant as it forms inside. Cold weather brings out brighter and darker colors in the leaves, and makes the plants form tighter heads. 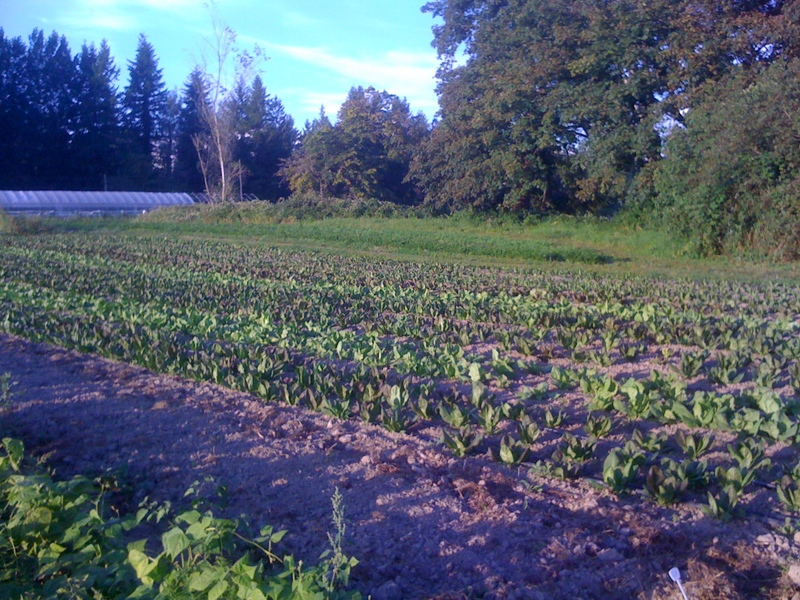 Here is a picture of our fall crop, growing in the field in late August. Now, in the middle of September, these are just beginning to “head up”, or form the blanched inner leaves, and we will start to harvest them in mid-October. All the varieties of radicchio that we grow originate in the Veneto region of Italy. They were originally derived from wild chicories, and were developed by a Belgian seed breeder in the mid 1800’s who named them after different towns of the region: Treviso, Castelfranco, Verona, Chioggia… This is one of our favorite parts about these beautiful plants. These small towns and hamlets in the Veneto have their own variety, bred and selected over generations, and celebrated in festivals in the fall. This is the sort of hyper-regional food love that makes Europe both wonderful and subject to a certain mockery. To us, people in Seattle should love bitter greens. I mean, as a city we certainly drink a lot of coffee, and that’s pretty bitter. “But most of us drink our coffee with milk, which balances the bitterness,” you might retort. But I’m one step ahead of you… The recipe I most commonly give to radicchio neophytes is to caramelize onions, leeks, or roast garlic and to mix that delicious allium sweetness in with the radicchio. When dressed with a balsamic vinaigrette, the sweetness balances the bitterness so well it’s like they were made for each other. Kinda like, say, coffee and cream. Another wonderful recipe for radicchio is to grill it. I cut them through the root end, either halving or quartering the heads (depending on the size), toss in olive oil, and sear for about 90-120 seconds on a cast iron griddle. Once the cut side is browned and caramelized, I flip the head over to just wilt the other side. I usually dress them with aged balsamic vinegar and some shaved Parmesan. 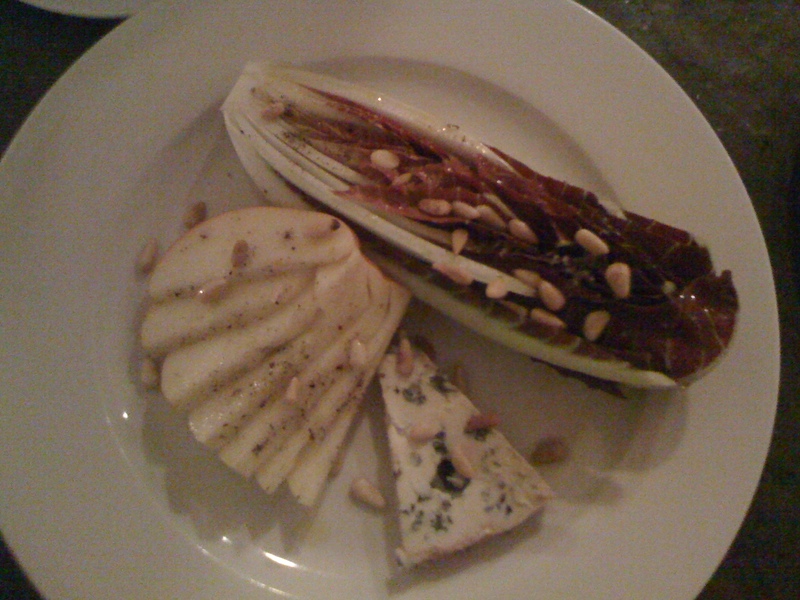 Paired with apples, pears, and some pine nuts or walnuts, and you can approximate the way they serve it at Boat St. Cafe. If you are feeling timid about trying out radicchio for yourself at home, you can find it prepared tremendously well at these fine establishments: Cascina Spinasse, Sitka and Spruce, The Corson Building, Poppy, Marjorie, The Art of the Table, Sutra, Boat St. Cafe, and The Walrus & The Carpenter. Thanks to Kimberly McKittrick for the photos of Treviso and Chioggia, both taken at the Queen Anne farmers market. You can also make red salad, with ribbons of radicchio that has been grilled or roasted, slices of red beets, and slices of tomato. I dress mine with a honey/olive oil/raspberry vinegar dressing. on September 30, 2010 at 11:23 pm | Reply J. Reyn. 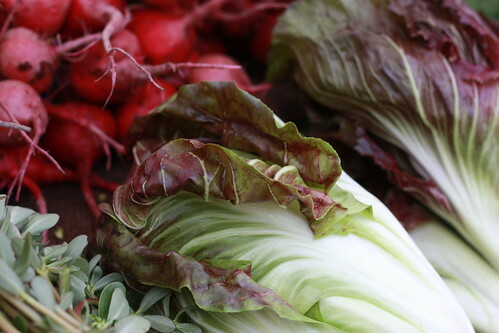 They need to put more raddichio in our CSA boxes!